Wild squalls blustered down to batter us at an exposed 3400ft and swathes of swirling mist chose that moment to lock down all the views. But at the first glimpse of the white stuff in the corries to the north I knew snowball fights were inevitable. Equally predictable, once the missiles were fired, was my role as a human shield. Mothers know their place even when the “kids” are nearing 30. Solitary Ben Wyvis lies midway on the road to Scotland’s west coast from Inverness. It’s not a magnificent hill; it can’t boast fine lines or soaring crags, but (on a fine day) it’s renowned for the extensive vistas to east and west. I’ve driven past it for 35 years and yesterday we climbed it on a day of rain, mist, gale-force wind and the very occasional blink of weak sunshine. So it’s not for a fine panorama of Highland scenery that I’ll cherish the day, but the rare company of both my boys. The younger one is home from New Zealand for a brief visit and the three of us were on a long-promised Highland hike. Tents, sleeping bags, food, stoves, rucksacks and three full-sized adults were stuffed into my Mini and we headed north to a soundtrack of atrocious weather forecasts. The tents remained unpacked and instead we retreated to climbers’ hostels with their accompanying pubs, pool tables, wifi and big industrial kitchens. Yet the hills still beckoned even when we couldn’t see them for the torrential rain or misted-up windows. 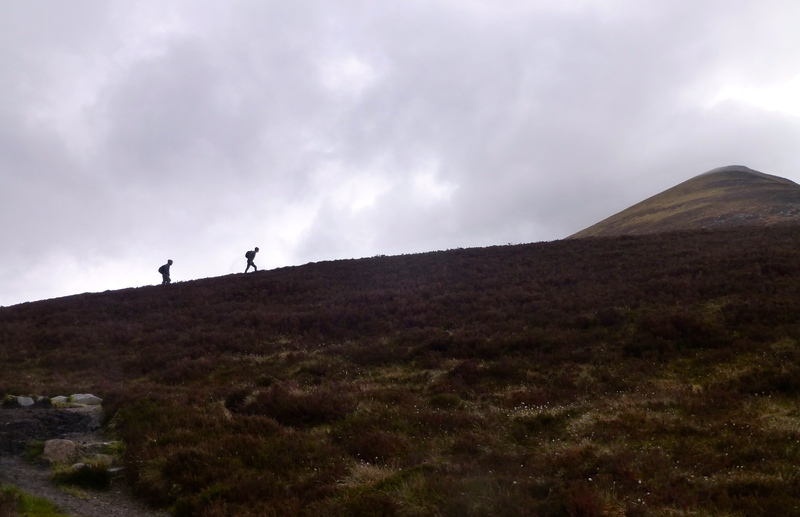 We reviewed our ambitions and instead of aiming for long multi-mountain circuits we chose Ben Wyvis. We strolled gently through dripping birch woods; followed tumbling Highland streams to lower slopes then climbed steep stone steps as views teased and then evaporated. Mist soared upwards in spins and wisps then closed in to hide everything but the few feet in front of us. Then suddenly we were up on the broad high ridge that stretches for a couple of kilometres along to the peak of Glas Leathad Mor. A rocky outcrop gave shelter to munch sandwiches and chocolate then we piled on every last piece of warm clothing to reach the cairn at the far end of the ridge. 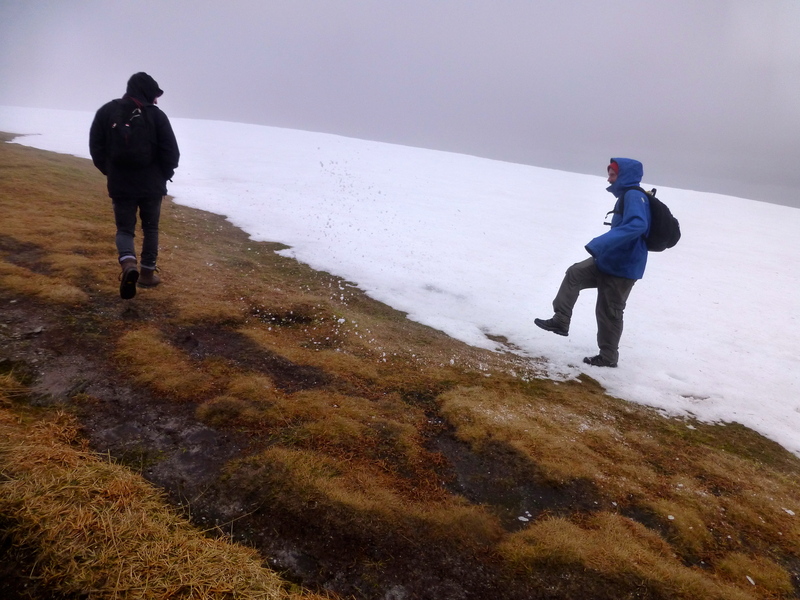 The thick snow that lay clumped and accessible in the corries was an entertaining distraction from the cold and wet. 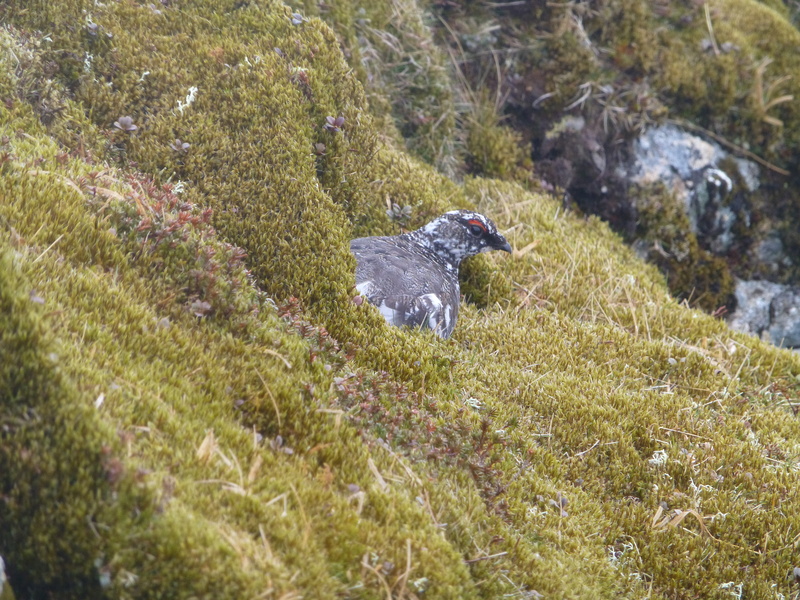 A solitary ptarmigan disguised as a rock made a dash from his hiding hole then sat stock still as we watched and took pictures. Pints in the bar and fish and chips were our reward then card games and drams from a hip flask entertained us. I was in my bunk long before the boys (ok, men) but wakened to the sight of their sleeping heads on nearby pillows. It has been a while so yes, I know it’s soppy and I’m biased, but it was the best view of the week. Sounds like a wild and wonderful day! The pubs, pints and wee drams sounded like perfect ways to warm the inner soul. There are always pubs involved when I’m in that company. And they have more stamina on that front as well as on the hills! I’m very lucky Maggie, and I know you understand as you walked the camino with your daughter. Adventures create great memories. Beautifully written and heartfelt. Such joy, sharing your love of country and hobby with your – men – and it came through your written words to us. I enjoyed reading about your time together. Thanks Sheila. We had a great time. That sounds like a wonderful way to spend time with your sons. It’s great to have a common interest Anneli. They used to resent being “dragged” up hills, but no longer. Learning curves are often like that! Yes, a special trip. I’m already plotting the next one!